The time has come, once again, to work on Sunday afternoons. Arlequino and I have had a lovely and busily social weekend. It’s warm, sunny; the air is that late, late summer blue tinged with gold. On Friday evening we treated ourselves to a gorgeous meal at our favourite restaurant in Waterloo, Nick and Nat’s Uptown 21. Occasion? Don’t need one. He ate a bowl of mussels in a yummy baked olive broth and then the biggest pork chop you’ve ever seen; I ate a sausage stuffed with cheese curds and served with a garlic aoli; then a watermelon, basil and feta salad, also with olives; then a piece of panfried lake trout with potato and bacon fritters. We sipped cocktails to begin our meal–one with vodka, fennel and lime juice; the other with gin and plum nectar infused with cardamon. Nick cooks; Natalie makes the drinks. We love the vibe and we love the food. I should have taken photos. On Saturday there are the usual errands. Shopping, dropping stuff off and picking stuff up. Dinner at home lovingly prepared by Arlequino and taken with the boy and his friend, and then a drink at our friends’ house. We sat outside beside an outdoor fire. We walked there and back. Sunday morning up earlyish, breakfast with family at a local diner, and now it’s time to work. Sunday afternoon work does mean doing course prep: writing or reading or surfing, usually all three. Making sure tomorrow’s presentation works (oh, and folks, Keynote is waaaaaaay better than PowerPoint. Just sayin’. And I got my image sizing difficulties sorted out. Thanks). I also re-read the literary texts we’ll be discussing tomorrow. Do you re-read every time? I sure do, as I need to have the words newly planted in my brain every single time. But Sunday afternoon work also means doing laundry, figuring out what to wear tomorrow, cooking food for the week, and making sure there’s stuff for lunches. I don’t know about your workplace but the food at ours is pretty grim. Lots of Tim Hortons outlets. Mediocre packaged sandwiches and wraps at the library cafe. Heated up canned soup. Greasy grill. You can get decent fresh sandwiches, but why bother when I can make the same thing at home? So my fridge is stocked with yogurts, veggies, cheeses, sliced meats, egg salad or tuna salad, fruit. At the office I have a water bottle, granola bars and a container of nuts. Sometimes a box of crackers. Sometimes I take leftover dinner and heat it up in the microwave. The upside of taking my lunch is that I eat well and very cheaply. The downside is that I don’t leave my desk. What about you? What do you do on Sunday afternoon? In reading the memoirs—more of which I find all the time—written by people who were German children during the war, I am struck by how food is a constant preoccupation, both in their lives and in their narratives. These children were hungry, even starving. Of course, the memoirists are those who survived to tell their stories; many other children died from lack of food or from illnesses brought about by contaminated drinking water and unsanitary housing conditions. They died from exhaustion and exposure. And, of course, they died from gun and bomb attacks. But food. There was never enough of it during the war. Scarcity of food was even more of a problem after the war was over. Crops had been destroyed or exported; farm animals had been slaughtered or (especially horses) confiscated by the Wehrmacht. People scavenged and hunted. Wolfgang Samuel recalls setting traps for small animals, fishing with a homemade rod, scrounging for edible weeds, berries and mushrooms. Women made meals with potato peelings. Fat was hard to come by. Bread was sour and scarce. Potatoes were sometimes all they had to eat. People traded whatever they had for food. Sometimes women traded their bodies for food. My own mother recalls going with her aunt into the countryside to scavenge the potatoes or other root crops that had been missed by the harvesters. 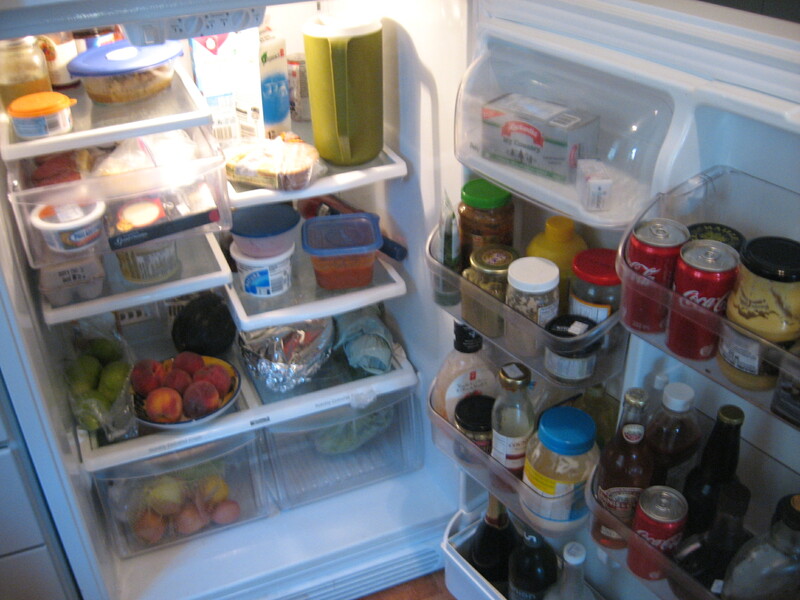 For the longest time I used to tease my mother about her habit of hoarding food: a 40 cubic foot freezer filled to the rim (much of the contents were fruits and vegetables that my parents grew themselves); shelves of pickles and preserves; sacks of flour, coffee, tea and sugar; a root cellar stocked with root vegetables. I don’t question this now. And, to be honest, in the 40 years that we have been in Canada my mother has learned to be more relaxed about food. But she was hungry as a child. She hates the taste of goat’s milk to this day, because that was what she had to drink when there were no cows. Food cultivation is everywhere in my family. My German grandparents until the day they died grew their own fruits and vegetables and kept rabbits in the back garden—which we occasionally ate for Sunday lunch. My aunt and uncle had an allotment. My parents always had a vegetable garden and fruit bushes and trees. I too have been known to grow vegetables. I have never known hunger. But I have a deep, embodied, ancestral craving for certain foods, like sour cherries, that are part of my German heritage. Potatoes are in my DNA. I eat them almost daily and prepared in every conceivable way. Those of you who know me will recognize this. First, make the meatballs. Soak the bread in water; squeeze it dry. 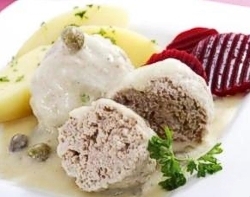 Place in mixing bowl with the ground meat. Add the bacon, anchovy fillets, onion, egg, salt and pepper and mix well with clean hands. Next prepare the broth. Boil the water (or stock and water), add the salt, bay leaf, onion and peppercorns. While the water is coming to a boil, shape the meat mixture into balls measuring about 2 inches in diameter. Add to the boiling broth; lower heat and simmer for about 20 minutes or until cooked through. Remove the meatballs with a slotted spoon, set aside and keep warm. Reserve the broth. Heat the butter in a heavy frying pan, stir in flour to make a roux. Cook for 3 minutes, stirring constantly. Slowly blend in 2 cups of reserved broth to make a smooth sauce. Add more broth if needed. Stir in drained capers, lemon juice and mustard. Simmer for 5 minutes. Temper the egg yolk by adding a spoon full of the sauce to it and then mix the egg into the sauce. Return meatballs to the sauce. Season with salt and pepper. Serve with boiled salted potatoes and pickled beets. The beets I have in my fridge are those my mother made. They are the best in the WORLD!